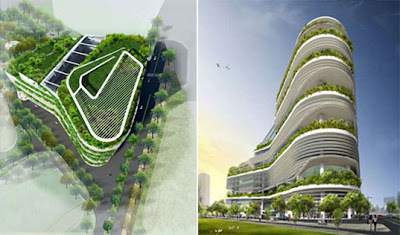 City of Silk ~ Great Kuwaiti Urban Gigaprojects! 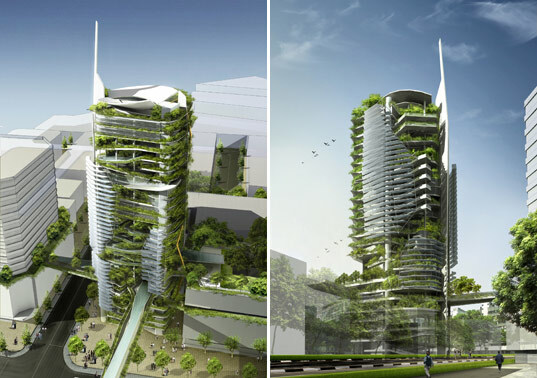 Urban Harvests ~ Roof Gardens As Sky Farms! 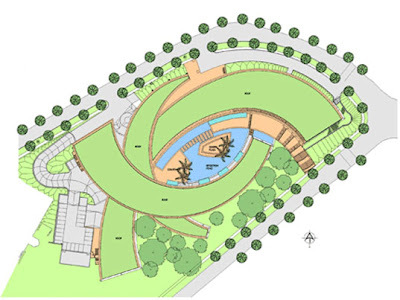 I wrote recently about MyFarm, the urban farming venture, as well as other examples of green-city living. CNN just published an AP piece on Agriculture goes urban and high-tech spotlighting hydroponics and other methods for growing high-value crops. 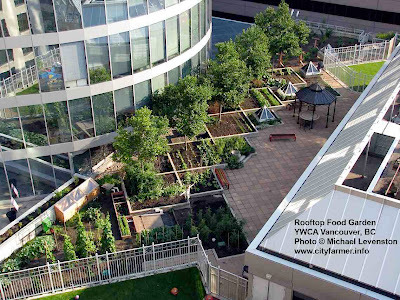 And, most exciting, I just stumbled on this great story in City Farmer News on the rich Rooftop Food Garden at the YWCA Vancouver in BC, Canada... Plus check out their video interview with Ted Cathcart, the Operations Manager and Rooftop Food Gardener at the YWCA. 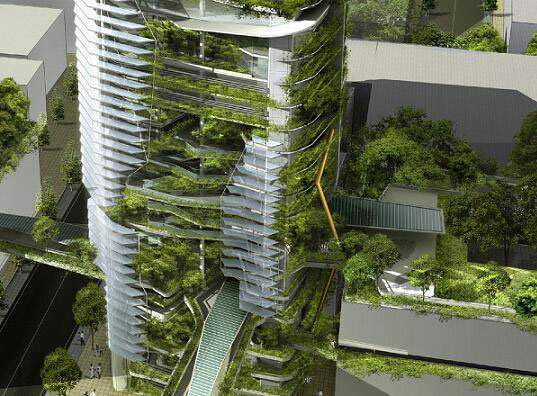 Vertical Gardens ~ Patrick Blanc's Living Walls! 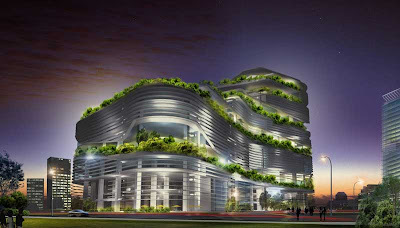 And stay tuned for more as Patrick has been commissioned to clad an entire skyscraper in Malaysia, the ultimate greenscraper! "...an entrepreneur focused on improving the lives of the world's poorest people, the 3 billion people who earn less than $3/day, often referred to as the Base of the Pyramid (BOP)"
RoboClam ~ MIT's Amos Winter Mimics Mollusks! 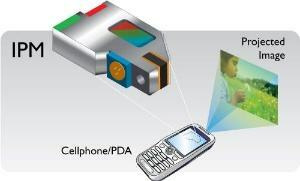 WiTricity ~ MIT Spinoff Wirelessly Powers Up! 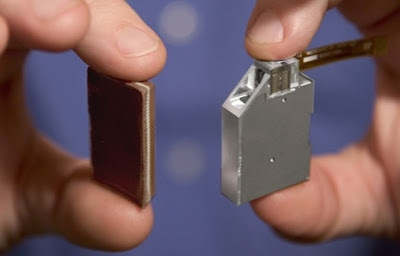 Scott Kirsner writes in his Innovation Economy column today about MIT spinoff WiTricity which is commercializing Professor Marin Soljacic & team's near-field magneto-inductive coupling or "wireless power". Check out Scott's video interview with company CEO Eric Giler. "Stepped on a train at a Berlin railway station, waved goodbye to the parents he would never see again and headed for Britain." "To its eternal credit the British Government was the only one in the entire world that said "Right we have got to do something about this." "All I remember is a feeling of unlimited kindness..."
But what are we -- humanity today -- doing for the equivalent children worldwide? Whether those kids are in Sudan, or Haiti, or Bangladesh, or the Congo, or they are the kids of in-migrants, or are the poor kids of inner-city USA? These children are no less valuable than young Silbermann and his peers. This is what kills me about the pograms on the US southern border with Mexico. And the building of despicable barriers between peoples. The US stole the land from the Mexicans and now self-righteous Americans kick out the rightful owners of the land, all of them legitimate Mexican migrants. 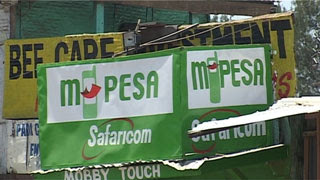 Videoreporter Ruud Elmendorp tells the story of M-PESA money transfers using mobile phones in Kenya... As Noel Mwakugu of the BBC wrote about last year, this M-PESA service by Safaricom and Vodafone is available to anyone, even if they do not have a bank account or a bankcard. 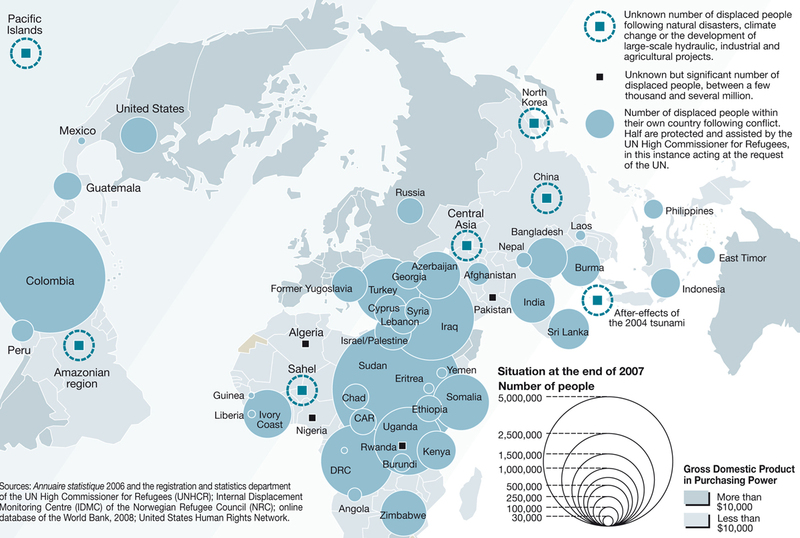 Visualizing Complexity ~ Lovely Maps & Graphics! 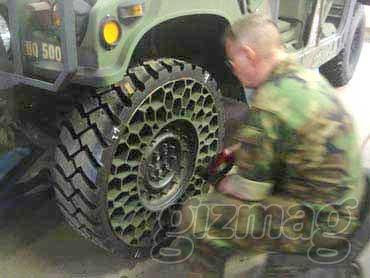 Airless Tires ~ Reinventing Even The Oldest Stuff! Justin Cook ~ The Prospect Theorist Visits Again! 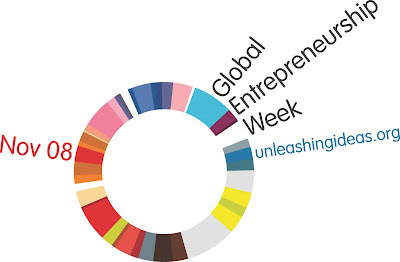 As part of the Unleashing Ideas Global Entrepreneurship Week, MIT is hosting several cool activities including dinners, talks, showcase and more. Check out the calendar at the MIT Enterprise Forum Global website. "make the world work for 100% of humanity in the shortest possible time through spontaneous cooperation without ecological damage or disadvantage to anyone." Still a worthwhile goal. And with computers, the range of games and simulations accessible to all has never been greater. These games and simulations can be tremendous tools for teaching and learning as documented by MIT alums Edery & Mollick in their book, Changing the Game. Consider the popular Sim video game series by Will Wright at Maxis, including SimEarth. Curiously enough, Wright's first big success, SimCity, was based on the Urban Dynamics work of MIT Sloan Professor Jay Forrester, creator of the System Dynamics method. Forrester went on to build the World Dynamics models which became the basis for the Limits to Growth family of models (and popular books). 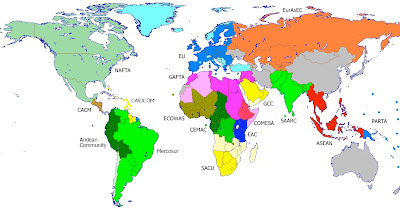 While the intellectual battle still rages between the so-called peaknik doomsayers and their opposites, the cornucopian doomslayers -- both with different prognoses about what is happening and/or will happen with our Planet Earth and our role in helping or hindering things -- what we can at least agree on is the need for more data, greater transparency, sharing of underlying assumptions, opening up of the underlying models -- whether mental, econometric, system dynamic, computational, etc -- and a relentless pursuit of greater understanding and truth. Games and simulations can play a transformative role here. 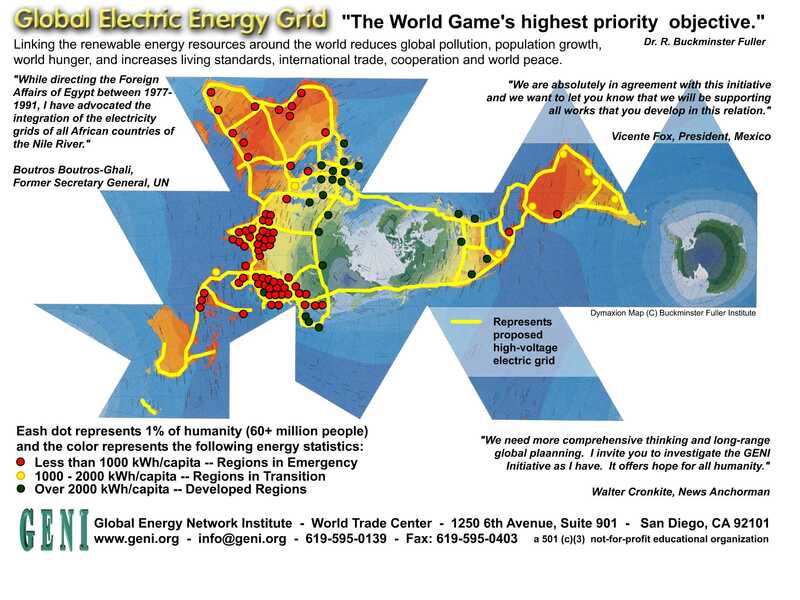 Electric Grid ~ Global Infrastructure Solutions? While grid solutions do seem to make sense in general and under ideal conditions, it nevertheless seems like a lot of good will come from off-grid innovations -- whether it's bringing first-light to remote villages through solar or it's creating backups and alternatives to the all-to-frequently "flaky grid". Singapore! 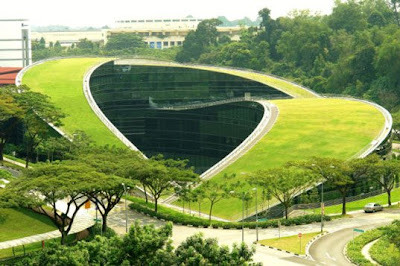 ~ Green Buildings in the Garden City! Goats as Gardeners ~ Rentable City Eco-Solution! "...is emerging as more than just a supplier. Its scientists are now bringing the technologies of tropical agriculture to other parts of Latin America, and to Africa and Asia. In 2006, Embrapa opened its first foreign office in the West African nation of Ghana to lead the effort. Lobato assessed soils in Mozambique this year. And in May, Embrapa dispatched its first team to Venezuela to help boost food production. 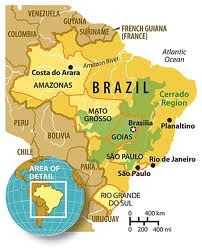 "In the 1970s, '80s, and '90s, there was a lot of collaboration and support from the US and Europe," says Elisio Contini, head of Embrapa's Office of International Affairs – helping to turn Brazil into the agricultural powerhouse it is today. "Now we think it's time to transfer technology to other poor countries in Latin America and Africa. We are supporting them like the Americans supported us." "Egypt is preparing legislation that would give citizens a stake in dozens of public sector companies in a move designed to address popular misgivings about the state's privatisation programme. [The proposal is that] all Egyptians above the age of 21 would receive a certificate of ownership of shares in a range of companies owned by the state. 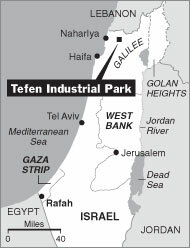 In a country with a socialist legacy from the 60s and with widening income disparities in recent years, privatisation has come to acquire a bad name, and there are frequent accusations that state companies are being sold off to government cronies and foreigners at bargain-basement prices. Analysts say that by transferring ownership of the assets to the general public, the government will make privatisation more popular. "This will push privatisation much further because it will eliminate all the problems and accusations that companies are being sold cheaply," said Aladdin Saba, chairman of Beltone Financial, an investment bank. "A foreign investor who wants to buy will have to make a tender offer in the stock exchange. There will be no issue over price or accusations that anyone took a bribe or that public assets are being under valued." There's some precedent for this kind of thing, including the Alaska Permanent Fund dispersing oil income on a per-capita basis to state residents, and Voucher Privatization in Russia and Eastern Europe (with mixed results). But there is dramatically more opportunity here for what I call Percapitization, the per-capita privatization of state and common assets -- including land, mineral rights, state-owned enterprises, and more. Imagine the percapitization of organizations like PEMEX in Mexico, thus distributing the ownership of this vast business among all the peoples of the country -- unlike prior privatizations, for instance Telmex. Biogurt ~ MIT's Edible Designer Bugs at iGEM! TR's Emily Singer writes about an MIT student team Engineering Edible Bacteria to create Biogurt full of microbes that fight cavities and produce vitamins. This was one of the great participants at iGEM 2008, the International Genetically Engineered Machine Competition this past weekend. Check out the TR Biogurt video as well as the iGEM Results and participants. These are all case examples of grassroots student excitement about the blossoming field of Synthetic Biology. "A United Nations experiment designed to boost health, agriculture and education in African villages has shown “remarkable results” but could be difficult to replicate at a national level, an independent study has found. [The project] has sought to showcase the benefits of heavy investment using 12 groups of settlements across 10 countries. In a new study, the Overseas Development Institute, a London think-tank, found there was “considerable evidence of significant improvements at household and village levels in the health and agriculture sectors”. But it said the project’s reliance on highly trained staff meant it could be hard to replicate at a national level." "One critic of the project, Michael Clemens, a research fellow at the Center for Global Development in Washington, points to a similar donor-funded initiative – the Southwest Poverty Reduction Project in China between 1995-2000. Within five years of subsidised inputs ending, the villages were no better off than those that had not benefited. “What creates sustained growth and poverty reduction is the interaction of village economies with towns and the wider world economy – not pouring in vast amounts of resources to an isolated community,” he says." I really applaud this as an effort to aggressively explore how to influence villages to be more prosperous, more vibrant, and more effective for the villagers. But, based on our MIT experience with Development Ventures, what I suspect is most needed are a new set of grassroots-oriented Villager Ventures, organizations supplying both village-scale solutions -- e.g. energy like BlueEnergy, health services like ClickDiagnostics, delivery services like United Villages, and more -- as well as household-scale solutions -- e.g. biogas energy by FertilGas, solar lighting by SELCO, and more -- all on a for-profit basis that compensates and motivates an entire food-chain of entrepreneurial people. "A national initiative to meet the infrastructure, economic development and environmental challenges of the nation [adding] 120 million additional Americans by the year 2050." "We are one world. 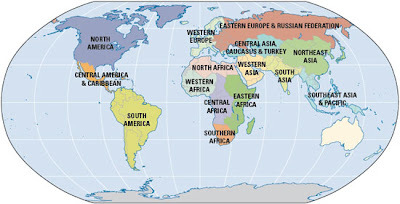 All organisms crammed on the globe are intricately interdependent. Plants, animals, humans need to find a way to live together on that tiny little place. By 2020, most people are acting on that belief. The population has largely stabilized. The spreading prosperity nudged a large enough block of people into middle-class lifestyles to curtail high birth rates. In some pockets of the world large families are still highly valued, but most people strive only to replicate themselves, and no more. Just as important, the world economy has evolved to a point roughly in balance with nature. To be sure, the ecosystem is not in perfect equilibrium. More pollution enters the world than many would like. But the rates of contamination have been greatly reduced, and the trajectory of these trends looks promising. 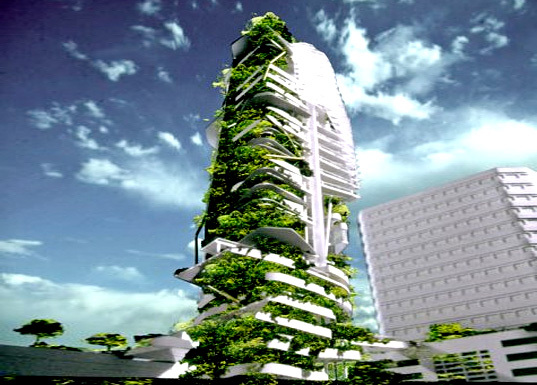 The regeneration of the global environment is in sight." "By 2050, the world had finally achieved a global economy that appeared to be environmentally sustainable, while providing nearly all people with the basic necessities of life -- and the majority with a comfortable living. Different explanations have been given for the series of astounding successes achieved by 2050. Some believe that breakthroughs in science and technology were the key. Others argue that development of the human potential was more fundamental -- and still others that political and economic policies made the difference. All three themes were important and mutually reinforcing." 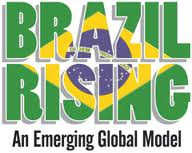 "If things go right, in less than 40 years, the BRICs economies together could be larger than the G6 in US dollar terms. 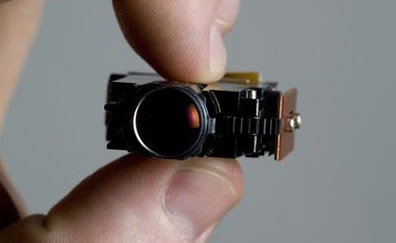 By 2025 they could account for over half the size of the G6. Of the current G6, only the US and Japan may be among the six largest economies in US dollar terms in 2050. The list of the world's ten largest economies may look quite different in 2050. The largest economies in the world (by GDP) may no longer be the richest (by income per capita), making strategic choices for firms more complex." "The relative size in the period to 2050 of the 17 largest economies in the world in purchasing power parity (PPP) terms. These comprise the current G7 (US, Japan, Germany, UK, France, Italy and Canada), plus Spain, Australia and South Korea, and the seven largest emerging market economies, which we refer to collectively as the ‘E7’ (China, India, Brazil, Russia, Indonesia, Mexico and Turkey)." "The analysis to 13 other emerging economies that, while smaller than those of the E7, also have the potential to grow significantly faster than the established OECD economies. Some of these countries, such as Vietnam, appear to have immediate potential as inward investment locations for manufacturing in particular. Others, such as Nigeria, may appear to be high risk propositions now, but have considerable long-term potential if they can achieve and sustain a greater degree of political stability and economic openness in the longer term. The general message is that investors with long-time horizons should not restrict their attention only to the BRICs or even the E7 -- there are many other alternatives worth considering depending on the nature of the investment and the risk tolerance of the investor." "Today’s advanced economies are to become a shrinking part of the world economy: in less than 50 years, China and India together could match the size of the US in current dollars (26.6 against 26.9% of the world GDP in 2050). China and India will stand out as an engine of new demand growth and spending, their GDP will grow at yearly average rate of 4.6 and 4.5%, respectively between 2005 and 2050. The largest economies in the world (by GDP) may no longer be the richest (in terms of income per capita)." Non-Stop Train ~ Fast-Rail Innovations! "Places do well when they promote transformations along the dimensions of economic geography: higher densities as cities grow; shorter distances as workers and businesses migrate closer to density; and fewer divisions as nations lower their economic borders and enter world markets to take advantage of scale and trade in specialized products." "Economic growth is seldom balanced. Efforts to spread it prematurely will jeopardize progress. Two centuries of economic development show that spatial disparities in income and production are inevitable. A generation of economic research confirms this: there is no good reason to expect economic growth to spread smoothly across space." "The experience of successful developers shows that production becomes more concentrated spatially. The most successful nations also institute policies that make basic living standards more uniform across space. Economic production concentrates, while living standards converge." Yes indeed, my MIT alum friend and current U Michigan engineering Professor John Hart and his nanonerd compadres have fabricated Nanobamas, small-scale carbon nanotube facial images of President-Elect Obama, each made of approximately 150 million tiny carbon nanotubes, or about how many Americans voted on November 4! Yes, this is extremely geeky... and I love it!-) Here's how you too can DIY Nanobamas! CHANGE.GOV ~ Open (Source) US Government? Open (source) government?! Check it out -- change.gov -- looks promising. Let's see what this means and where this leads. Epic! ~ US Elects President Barack Obama! Yes, I admit I was extremely skeptical that this would even be possible, nevermind actually happening! But Barack Obama -- a man who would not be considered a full citizen and barely even a human being at the birth of the United States of America some 230 years ago -- has just been elected President by a populace inspired by possibilities, invigorated by hope, open to opportunities, and engaged in an agenda of change and transformation towards a new and better tomorrow! Epic! Now, of course, comes delivering on promises. Keynote: Darryle D. Schoepp, Ph.D., Senior Vice President and Neuroscience Franchise Head, Merck Research Laboratories, PA. Dr. Schoepp is responsible for the scientific direction of drug discovery and development for neuroscience programs at Merck. Prior to joining Merck he was a VP at Eli Lilly, where he led the development of a new first-in-class drug for the treatment of schizophrenia. More info (and sponsor, partner, and presenter bio details) on the MIT Enterprise Forum website. Students free with ID. Everyone should pre-register! This is a not-to-be-missed session on neurotechnology ventures! "...an enterprise that puts vegetable gardens into people's backyards, then sends a gardener once a week to do upkeep and harvest, leaving a weekly basket of fresh produce behind." MyFarm founder Trevor Paque had the great idea to turn otherwise underused urban land into a productive "decentralized urban farm". "MyFarm charges customers $800 to $1,200 to install the garden. Then for a weekly fee that varies according to the size of the plot, a gardener weeds, tends and harvests the garden, leaving the owner with a week's worth of vegetables. For time-starved residents, MyFarm is a way to get organic produce grown steps from their kitchen without having to touch a trowel. 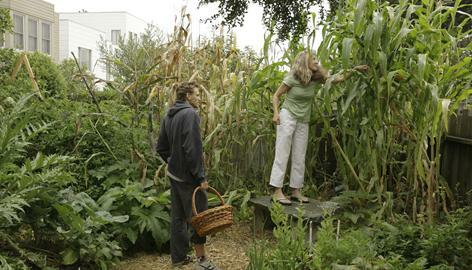 For yardless neighbors, it lets them effectively buy a share of their neighbors' gardens. What makes Paque's venture different is that he sees all the gardens as merely components of one large farm."